Today’s Small Business Success Story spotlights Summer Rognlie Trisler. Summer is the director of Seattle-based music program, Sunshine Music Together. 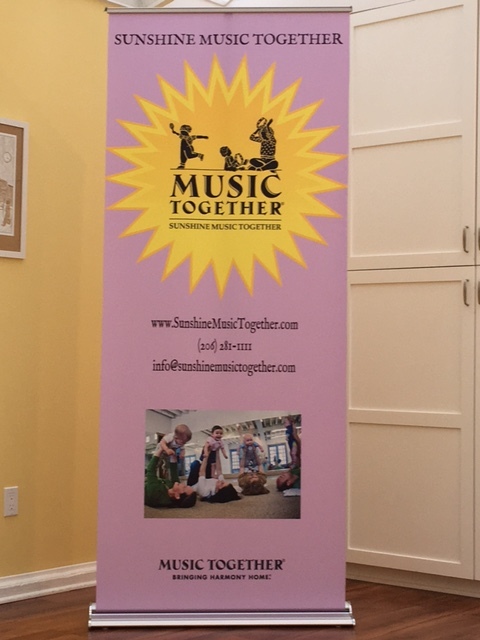 Summer purchased a fabric banner, retractable banner, and opaque static cling window decals to help promote her wonderful music program. You can see some of the custom signs in the pictures throughout the interview. My background is in theater. I went to college in LA for theater at California Institute of the Arts and moved to New York after graduation. Work took me all over Europe and then London, then back to New York. I was an actress on Broadway and in the West End of London for years before retiring from the profession to start my own business. Summer poses with a participating family of the Sunshine Music program. We are a music development program for children from birth to five years old and their parents or caregivers. I am a Music Together licensee. 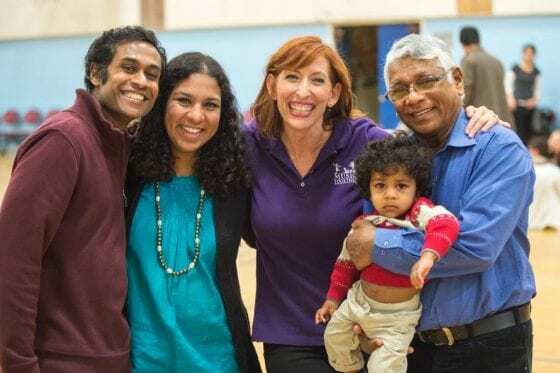 Music Together is an award winning, internationally recognized early childhood music development program that was developed 28 years ago at the Center for Music and Young Children in Princeton. 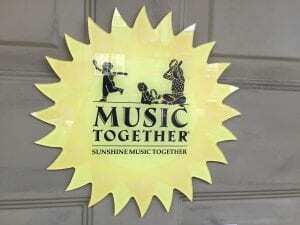 The Sunshine Music Together logo created using an acrylic sign. When I was working on Broadway I had one day a week off from an 8 show week and I was looking for a parent-child music program that I could do with my young daughter. The man who was running our lighting for the show I was in and I used to commute to and from the city on the park and ride and the bus together. We got to talking and he told me his wife taught a program called Music Together and I should check it out. So I did! I’ll never forget the first day of class with my daughter sitting in the circle thinking “this is BLISS.” What an AWESOME job! I knew that once my daughter started full day kindergarten I would retire from performing because I’d never see her. I did 8 shows a week, every weekend and every holiday, so at that moment I realized this is what I would segue into from performing. I fell in love with the idea immediately. 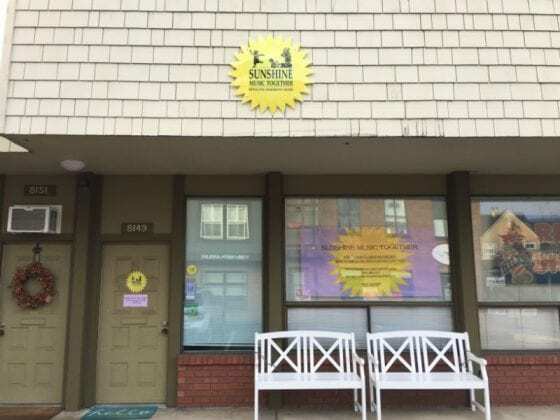 There are other Music Together centers out there in my area, but Sunshine Music Together (we each own our own center) has grown substantially over the past 10 years to well over 500 families and now 6 locations. We won the 2016 Growth Award from Music Together LLC and have gone on to be a consecutive 5-year winner of the Parent Map Golden Teddy Award as well as the 2016 Red Tricycle Totally Awesome Award Winner for Best Music Program in Seattle. I think the reason we’ve grown so much is because we literally LOVE what we do and we’re passionate about our mission to bring the joy of family music to our communities. You mention there are other Music Together centers out, but how free are you to do what you please vs. doing what Music Together mandates? We all use the research and materials from Music Together, but we, of course, all have our own individual styles. Licensees and teachers are advocates of this stellar program. Music Together has done all the research for us — it began 28 years ago — but still continues with ongoing research in the field that is passed on to licensees and teachers. There is an intensive training that every Music Together teacher needs to complete and pass before becoming a registered Music Together teacher. Once you’ve become registered, you then embark upon a 10-week apprenticeship before you ever begin to teach. You can’t just send away for the materials online and become a teacher or take an online course. Music Together mandates a certain level of preparedness and integrity towards how the program is taught and presented to families, but we each bring our own unique style and gifts to our individually owned locations. What is one strategy for gaining customers that you have been successful with? Hands down the best publicity is word of mouth — but in order to spread the word, you need to get customers/families in the door. I vowed early on when I first started that I wasn’t going to fail because I didn’t market it properly. I thought it was important to take out a small business loan to afford the advertising and marketing needed to bring families through the door. I would track which marketing avenues worked and which were a waste of money — then would focus my entire marketing budget only on the avenues that worked. Once you have the families through the door, though, you have to deliver. I have been meticulous about the quality of teachers I’ve hired and have personally apprenticed each one before putting them on the schedule. I’ve let a few go along the way. I would rather not have enough classes to offer than put a less than stellar teacher out there just to supply the demand. You mention only focusing on the marketing avenues that worked. Can you share which ones worked and why? Or which ones didn’t and why? I personally found that print ads in local community papers were a waste of time, nobody reads them anymore and they were more expensive than many other avenues that worked better. I target 3 specific online resources that also publish monthly magazines specifically catered to parents. I also utilize Facebook and social media to get the word out. The publications and online sources that worked the best for me in Seattle were Red Tricycle Seattle, ParentMap and Seattle’s Child. The BEST marketing is word of mouth. Once you get people in the door, you must deliver exceptional services to keep them there. The retractable banner used for Sunshine Music Together. Is there an area that you’ve struggled with in regards to customer acquisition that you believe is critical to future success? If so, how are you overcoming that? Finding great teachers has been the biggest challenge. Out of desperation in the past I have hired teachers who had taught in other centers and trusted to put them on the schedule without apprenticing them, only to realize after losing a ton of families that not every center holds their teachers to the same standard. After that, I’ve made sure to apprentice every teacher, no matter their past experience, to ensure they’re up to the standard my families have grown to expect. We have a solid reputation for good teachers now because of the effort made to ensure quality. How do you compete with the bigger competitors that are similar to yours but have a recognizable brand and large marketing budgets? Quality, quality, quality. Quality over quantity. You can be huge and have great marketing and get people in the door, but keeping them there is the challenge. I don’t focus on the competition, I focus on the quality I’m offering our families. They keep coming back and bringing their friends. You mentioned quality over quantity. Can you give an example of what you do or how you provide quality? In growth surges, I have desperately needed to add a lot more classes to accommodate the demand but did not have the perfect teacher available. I knew the standard that my families were used to and what was expected from my teachers. I could have put a less than stellar teacher on the schedule and filled the classes — but I knew it would be a disappointment and I could potentially lose all of those new families the following semester and damage our reputation through negative word of mouth. So even though the demand was there, I chose not to add the classes until the right teacher came along to do so. It was better to turn people away and stay smaller than to add more classes, grow bigger (temporarily) by going with someone out of desperation who was not at the level or standard expected. I provide QUALITY teachers and quality classroom experiences. No one wings it and we’re all very dedicated and invested in what we do. We love what we do, and that love and energy emanates into all of our classes. It makes a difference. Families join together for a Sunshine Music gathering. What is one of the biggest challenges you have had with your business and how did you overcome it? Finding good teachers. I think it’s true of any business — your employees are the face of your business; if you don’t invest wisely in them, it will hurt you in the long run. The other was trusting to let go of complete control administratively. I was drowning trying to keep up and do it all myself. I finally took the plunge and hired an administrator — best decision I’ve ever made. It takes a little bit of work in the beginning to train. It’s time-consuming initially when you know you could quickly do it yourself rather than explain everything, but once they’ve learned it’s heaven! Best decision I ever made because now I can focus on growing my business and nurturing my teachers. It’s important to be able to put your energy where it’s needed most. If you could rewind time is there anything you’d do differently? If so, what? I probably would have hired an administrator much earlier on knowing what I know now. I also wouldn’t have ever hired a teacher without first apprenticing them — I learned that lesson the hard way. If you had advice for other SMB owners, regardless of the industry, what would it be? Don’t fail in the beginning because you didn’t spend the necessary money to market your business. Do hire exceptional employees — don’t skimp here. Hire an administrator earlier rather than later. You mention finding exceptional employees. What is your approach to finding new employees? What do you look for (skills, previous experience, personality)? What resources (i.e. online, referrals, etc.) do you use to find potential teachers? The skills I look for are definitely personality and energy. Are they personable and warm? Will my families and children bond with them? Are they open and energetic enough to lead and inspire a room full of potentially shy adults to participate with enthusiasm in singing and dancing and being great role models for their children? If you have an under-energetic or reserved teacher, they’re not going to be able to gain that instant trust, connection, and participation. Once I find the right personality (you can’t teach that or train that, it has to be innate) then I make sure they are professional and dedicated enough to commit to the time, training and patience it takes to become a teacher. I can suss out pretty quickly who is serious about teaching, specifically Music Together, and those who think it will be just a fun side job to teach children music. There are a lot of hoops to go through — training, testing, apprenticeship and 3 workshops a year — so it’s not something that you can just show up to and wing. I personally have to invest a lot of time and energy into the apprentice I take on, and I’m not going to waste that precious time on someone who doesn’t REALLY want to be there and who is not ready to commit to the high standard that’s expected. How do you “WOW” your customers? By offering quality classes and building community. We make it a point to get involved in community events. Every year we offer free workshops at the Seattle Children’s Festival. 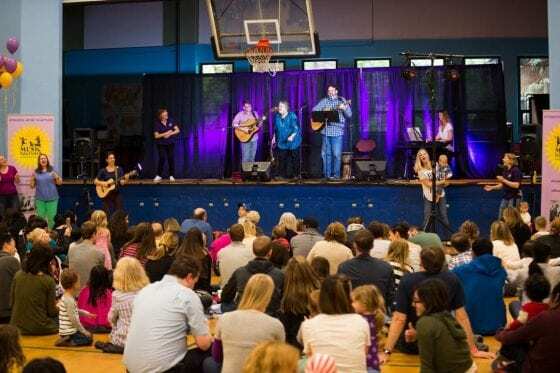 Last spring we held a big benefit concert for Seattle’s Arts Corps and raised $1,000 to put towards student internships in the arts and we do a yearly Parent Education Wine and Cheese Social just for our registered families. What do you think the future holds for your business? We hope to keep growing and fulfilling our mission of bringing the joy and benefit of family music making to as many families in our community as possible. Without sharing detailed financials can you speak to your growth to this point and why you think it will continue? We are opening two brand new locations this winter and those classes are already full. There is a huge demand through word of mouth, and up until now, I haven’t had the space to offer many of our families on wait lists. I started 10 years ago with one location and 18 families and now have 6 locations, 8 teachers, and over 500 families. When I first moved to Seattle, no one had even heard of Music Together. Since you’re opening 2 other locations, what is the process for expanding beyond 1 location? I have to apply to the Music Together LLC Headquarters for the location and license. They need to check the census statistics to make sure no other nearby licensees are affected. They also need to determine the needs of the community and potential for growth before giving the okay. It’s a given of course that as a licensee with other locations that your reputation is good and that your partnership has been good and harmonious. You don’t want any late payments of fees and insurances, etc. ; everything needs to be up to date. The Sunshine Music Together office displays a variety of signage, including window decals and a fabric banner. What can you share to help other small businesses expand beyond one location? Attempt the expansion only when you’re ready. Have excellent staff in place that you trust and start small. It’s better to offer less and create the demand than to offer too much. Step by step. Expansion should come from the growing need and demand of customers. Do your research on the area you’re thinking of expanding to. What do the demographics look like? Median income? It’s important to look at everything before putting a ton of money into a new place that may not have the demographics to support the new endeavor. Where can you be found on the internet? Editor’s Note: Thanks again to Summer for squeezing this interview into her busy schedule of being a business owner, wife, and mother. Like Summer, any small business can learn through trial and error on how to effectively advertise to its target audience. Finding publications that correctly reach your target audience is one of the major takeaways from Summer’s success. You don’t have to be everywhere but simply where your potential customers are! It goes without saying this will differ from company to company. Further, focusing on quality over quantity can help small business owners excel; this will require owners to devote time to finding passionate and personable employees and providing high-quality services. This focus on ‘human talent’ and a slow and steady mindset could be applied by many businesses that sacrifice quality in terms of employees and product in a never-ending quest for growth. Summer nails it in these areas! Community involvement is another lesson that can be learned from Summer’s example, showing that community-based businesses can thrive. Never underestimate the power of word of mouth through a quality offering and local connections! Through Summer’s dedication and love of music, along with hiring great teachers, offering quality classes and getting involved with the community, Sunshine Music Together has substantially grown and earned numerous awards during the last decade. Summer, you’re an inspiration to us all, and we hope you see continued success during the lifetime of your business.